The Revival half of this card is very exciting for anyone who likes reanimator strategies. Obviously it’s not part of the “I accidentally Akroma” style of reanimator card, but its converted mana cost restriction of three is higher than other recent cards that are comparable to it in cost. These days, a lot of creatures that cost three have as much impact as older creatures that cost four or five mana, and when you expand the card pool to things like Eternal Witness it allows you to set up ridiculous chains of Gifts Rock-style attrition. 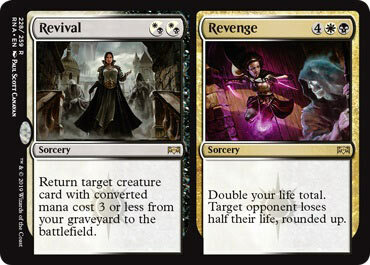 The Revenge half is intriguing, especially to anyone who has memories of Orzhov-colored creature decks that wanted to attack for the win but had trouble with late-game issues because they lacked burn spells. Revenge is obviously not a burn spell, but it does make your creatures’ job a lot easier. I think it may have even more potential in casual settings – recall the cards like Path of Bravery and Serra Ascendant that want you to have a life total of a certain number or even just higher than your starting total. That’s before you even get into the cards like Phyrexian Processor! The first half of this card, Revival, is an overcosted Unearth (the Urza’s Destiny card) that white can actually splash for. While the limitation is rather real, Orzhov (and the two colors that comprise it) have a healthy number of cheap creatures that Revival can bring back to play; one that comes to mind is Deputy of Detention in Azorius colors. While you’d only be able to cast half of this card in Azorius (without a splash), it has a unique-enough effect for the current Standard to maybe justify a splash. Revenge is a bit more unique; it’s almost never going to kill, but it potentially represents a huge life total swing in one card. Just to use Standard as an example, if you’re casting this on turn 6, you and your opponent will be probably close to 14 life or so. Revenge puts you at 28 and them at 7, a swing of 21 points in 1 card! It’s maybe not great for salvaging a near-certain loss, as you need to have enough life to really make this pop, but it can put a game away if you’re struggling to muster up enough of a force to break through their defenses. Both halves of this card are good, and I can see this having a very real Standard presence…depending on the fate of the Orzhov deck overall. If it’s present, you might see this a lot. If not, it may still rear its head as a surprise weapon from time to time. Revenge, at least, is unique enough to make for some interesting decisions.